Facebook’s advertising platform is an easy to use platform and a simple outlet to implement into your business’s marketing strategy. The difference between a successful campaign and a mediocre campaign is knowledge and strategy of audience behaviors and platform performance. Many companies jump headfirst into Facebook Advertising without taking the time to read up on the best practices and strategies. While you might be able to set up an ad campaign in just a few minutes with little knowledge of the platform, it takes time to hone in on the best Facebook messages and strategies for your marketing objectives. Facebook offers many layouts and presentation options, each with their own advantages and disadvantages. 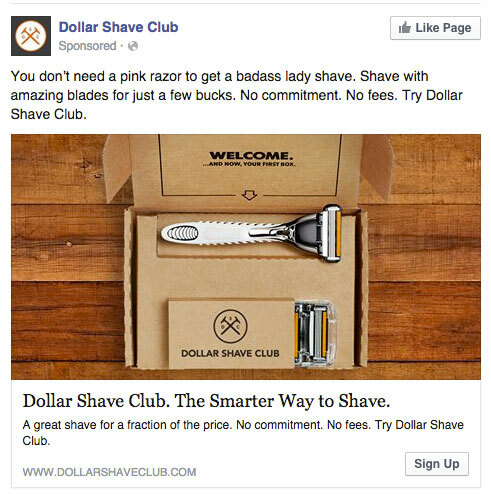 The right Facebook ad format fluctuates with your selected audiences and intended messages. Each carefully selected format contributes to how successful your campaign will connect with and engage the most individuals. Each audience set will have different engagement habits with ads on Facebook. Understanding the best method of contact will help you create the perfect campaign. Photo advertisements are some of the easiest to create. A single eye-catching photo accompanied by concise and engaging copy can easily persuade an individual to click through for more information on a product, service, or even to learn more about your company. Photo ads can be a simple and easy solution to building brand awareness to establish your brand in an oversaturated market. Because of their quick and easy to create nature, many Facebook ads are created in the photo format. This has led to oversaturation and desensitizing Facebook users to photo ads. A successful Facebook photo ad must stand out among the sea of ads users see every day. Video advertisements on Facebook offer an avenue perfect for longer and more complex messages. They are the easiest way to tell a story to your audience. A successful Facebook video ad is well developed and high quality. A Facebook ad with low visual quality will have a harder time attracting your audience. You must keep in mind that Facebook users prefer their video content to vary based on what device they are using. Mobile users are more likely to complete a video that is 15 seconds or less while a desktop user might be more inclined to watch longer content. A carousel ad allows you to display up to 10 images or videos in one interactive ad. Users have the ability to scroll or click through the many cards in the carousel. You have more space available to creatively tell a story, showcase products, or emphasize product features. Some of the most intriguing and engaging carousel ads display a panorama image across several photo cards. 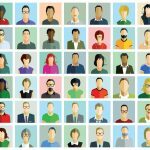 Unique creative elements are key to attracting your audience’s attention. Slideshow ads are an easy alternative to video advertisements. This format is great for small businesses looking to grow. Facebook’s advertising interface makes it extremely easy to create a slideshow with your own photos or stock images provided by Facebook. You can get the benefit of video without the lengthy production time. Just make sure to include engaging copy and music to your images. 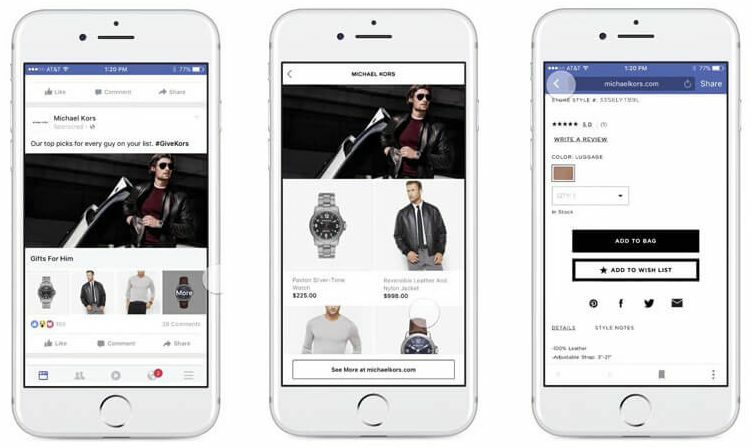 Facebook’s Canvas ads are immersive and interactive mobile experiences users can explore to understand your brand’s products, services, and personality. You can integrate photos, videos, carousels, and more into a single Canvas ad. Canvas can act as a seamless transition from Facebook to Canvas ad to your website. Canvas layouts power user engagement and promote brand interest. An interesting and engaging introduction will garner more brand awareness and sales. Creating Canvas ads requires a lot of work to create and once you post the ad it cannot be edited. Collection Facebook ads efficiently promote and sell your products. A main image or video catches a user’s attention while a selection of 4 product images appear below. Users are able to easily browse and select products from your catalog. This format allows you to catch a lead and prompt an immediate sell perfect for targetting impulse buyers. 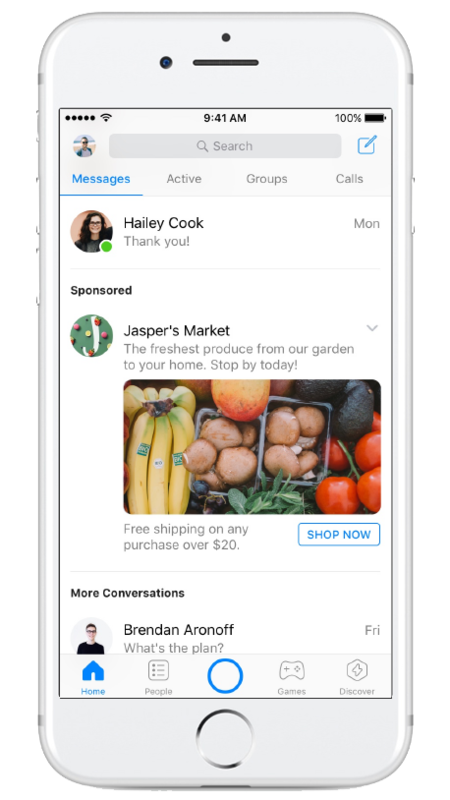 Messenger ads are the newest addition to Facebook’s advertising format options. These ads appear inside of the Messenger app’s home tab where users can see them placed between their different conversation threads. 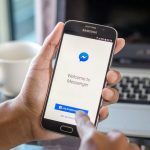 Users are typically more actively engaged when using the messenger app as they are using the app to talk with friends, family, and acquaintances. Their brains are more focus on the content shown to them at this time as opposed to when they are passively scrolling through their Facebook Feed looking for something that stands out.